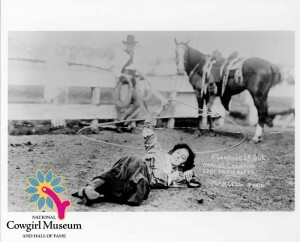 The only cowgirl to claim three world championships for trick and fancy roping, Flores remained undefeated in the event. Growing up on a Sioux reservation, she began her career with a Wild West show and there met her husband, Guy Weadick. Together they organized and produced the first Calgary Stampede while operating a dude ranch and producing smaller rodeos. Flores is reputed to have been the first trick roper to perform the trick known as the Texas Skip.